Amidst the confusion of the Thirty Years War, Duke Anton Günther von Oldenburg (1583-1661) achieved the impossible: He established a customs office along the Lower Weser. Indeed, in the Peace Traty of Westphalia in 1648, the Weser Customs Office was confirmed. Much to the dismay of, above all, the Hanseatic City of Bremen, each ship which navigated in either direction along the Lower Weser was required to pay a transit fee. 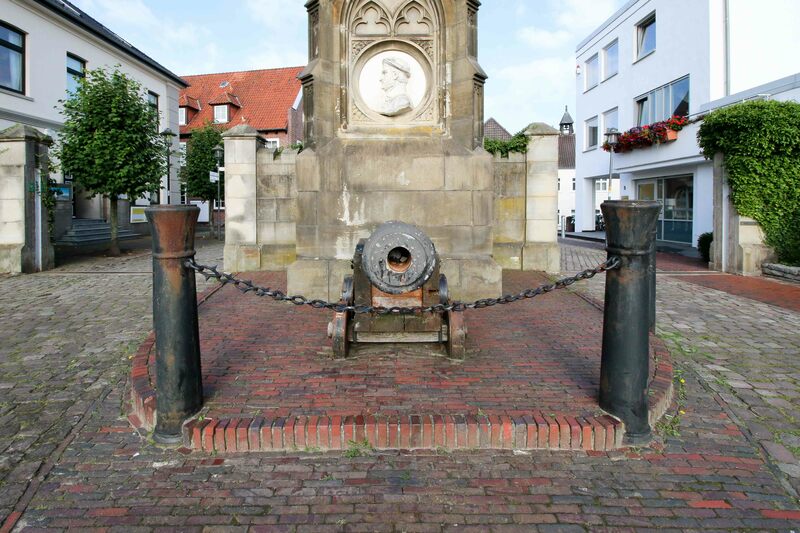 As a result, Oldenburg benefitted from impressive revenues until 1856. The first customs station was located in Brake-Harrien, it was established in 1624 in the current City Hall of Elsfleth. At this site, a model of the old customs station of Elsfleth and of the city center can been viewed. 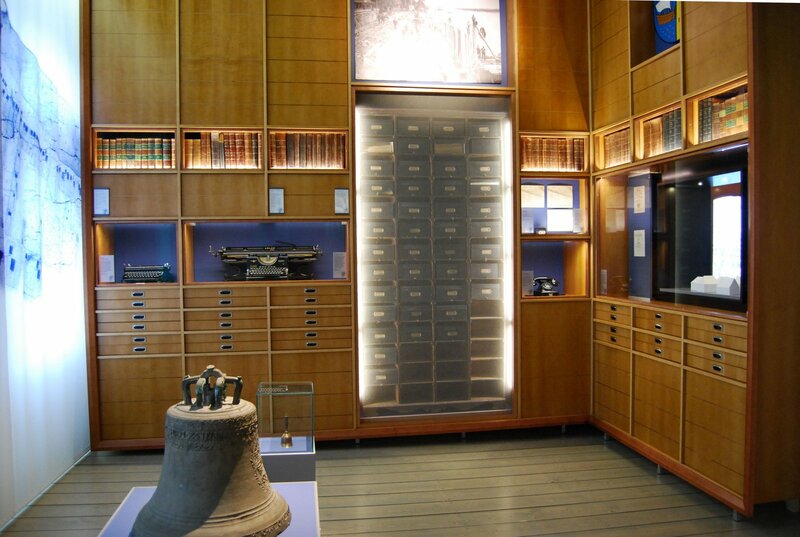 Further information is available in the Maritime Museum “Haus Elsfleth”. Since medieval times, the levying of customs duties has been an important source of revenue for governments and kingdoms. Even for the State of Oldenburg, which governed the left side of the Weser, customs duties were an appealing option. The Lower Weser was strategically the most significant trade route, especially for the Hanseatic City of Bremen. Accordingly, Bremen made every effort to keep its important connection to the North Sea free of duties. On the other hand, Oldenburg was keen on profiting from its geographical situation. Duke Anton Günther von Oldenburg and his diplomats worked towards this goal for more than 40 years, from 1612 to 1653. During the last five years of his tightrope walk between persuading and pressuring, he aimed specifically at gaining Bremen´s final recognition of the customs duties imposed. 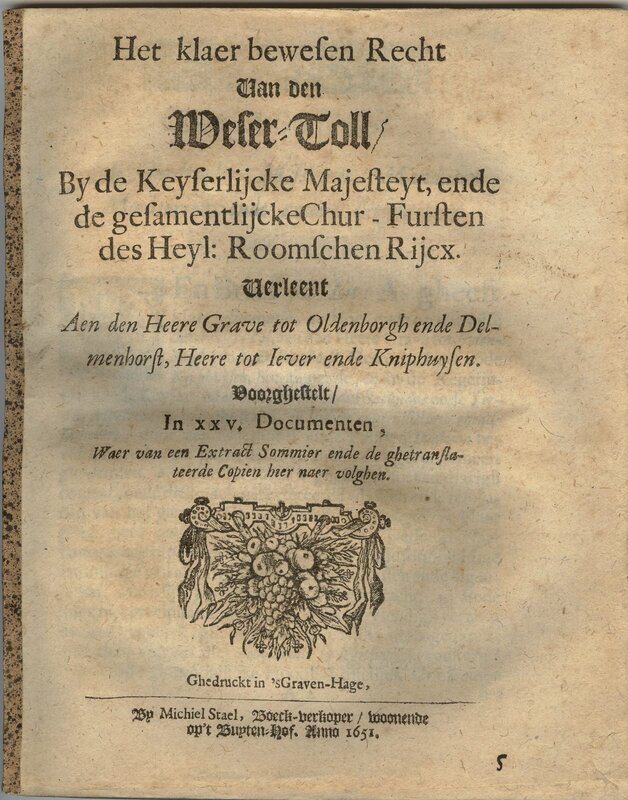 The Weser Customs Authority was then immortalized in the Peace Treaty of Westphalia in 1648, the very agreement which ended the Thirty Years War. The proud citizens of Bremen who regarded the customs as an affront finally gave in in 1653, after the Imperial Ban of 1652 compelled them to do so. The first customs station had been established in Brake as early as 1624, shortly following Duke Anton Günther´s stage win in the previous year. The Emperor issued certificates authorizing the levying of customs duties, and the Duchy of Oldenburg was now entitled to impose such taxes along the Lower Weser. The settlement in Brake, known as Harrierbrake at the time, however, proved to be an inadequate location. Thus, the customs station was soon relocated to Elsfleth. The warships of Bremen, nevertheless, did their best to prevent the fees from being levied, and the customs station in the City Hall of Elsfleth was even taken under fire. The Weser duty which was levied in Elsfleth came to an end, given that the German Imperial Mediatization of 1803 called for a restructuring of the States. Comparable to the difficulties once involved in implementing the duties, the abolition of the Weser customs also proved to be very tedious. Ultimately, Duke Friedrich Ludwig was able to delay the abolition up until 1820. In Elsfleth House you’ll find a model of the former toll station and various decrees and documents from the history of Elsfleth as a toll station. Let Klong, the toll collector’s bell, tell you its story.